The marooned party wandered around what was to tbe the Southwestern part of what is now Texas, New Mexico and Arizona, for almost ten years. Sometimes as slaves and sometimes as healers in the primitive system of curing illness in the wild. Today, it would be know as "faith healing." Consisting of the healers' breathing mouthfuls of smoke on the patents affected areas and reciting prayers. Apparently, the placebo effect favored the black member of the group, Estabanico, and he was awarded a feathered gourd rattle which singled him out as a full-fledged "Medicine-Man." The Northernmost outposts of New Spain was Campostella, fifty miles north of Mexico City, in what is today Culiacan. Everything north of that point was wild, uncharted territory and know as "Cibola." Cibolo, with an "o" at the end mean "buffalo" in Spanish. To 15th century Spaniards, the wildest, most vicious, strangest, most dangerous animal in creation. And since the word for land, "Tierra" is feminine noun meaning "land," this unknown territory was called "Cibola." (a female buffalo.) Metaphorically speaking, Cibola means "the wild, untamed land." The "Fountain of Youth, "El Dorado," etc were all incentives that appealed to the gold lust of, not just Spanish soliders, but of every mercenary and adventurer in the Holy Roman Empire, that could beg, borrow, steal, or flim flam enough money to get to America and cash in on every man's dream of eternal fame and unlimited riches. Now another fable began to make the rounds, that of the Seven Cities of Gold, somewhere in Cibola. The fables cities were were really a marriage of two ancient legends. The Aztec legend of a starnge, bearded race thay came from seven caves in what is now the Four Corners area of the United States, and an old Spanish legend about seven bishops that took their individual wealth and crossed the Atlantic where they founded the seven districts. If Spain was not planning to invade Cibola, she certainly gazed longingly Northward, as Cortes and Pizzaro vied for the new conquests. 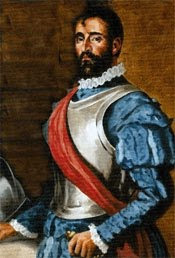 Peru had been the feathe rin Spain's war bonnet when Pizzaro took it, but Cortes checkmated him in the taking of Mexico. For all the wealth Pizzaro has accumulated, his chances of increasing his gains now became limited to Peru itself. The land between Peru and Mexico was already claimed and pillaged, but Cortes looked Northward and dreamed of expanding and finding Cibola. With more riches than he had found in Mexico? Yes! Yes! Yes! A New Mexico! Coincidentally Spain was massing forces in Mexico, so many that they posed disciplinary problems and coincidentally The Viceroy of Spain made Mexico City the seat of Governement. When Cabeza de Vaca and his companions refused to return to civilization, their tales of Cibola stoked the Viceroy's fire and he quickly organised an exploratory mission backtracking de Vaca.